Making pom poms is really straight forward. I’ve made them before, for my daughter’s birthday and school functions, but never shared a tutorial before. 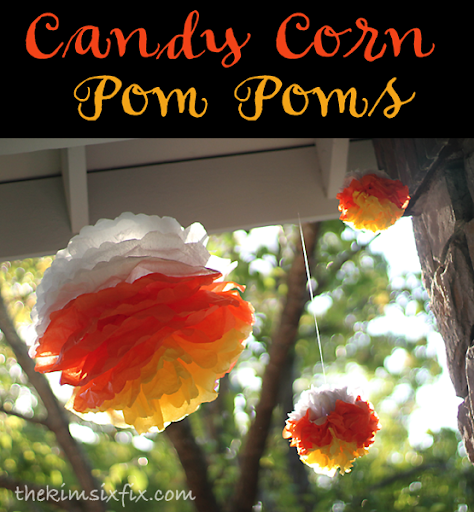 They are a go-to craft since they are so easy to make and you only need a few for a big impact. For the candy corn colors you want to layer your tissue with the orange between the white and yellow. I like 4-6 sheets of each color (the bigger the puff the more layers you need). I have seen tutorials that say you only need 10 sheets, but those tend to not stay ‘fluffy’. In my ‘professional puffball opinion’ you need at LEAST 12 sheets of tissue for a 20 inch puff. You want to take your time with this step and get as much of the tissue up and away from the center as possible (this makes it more full) and be sure to not pull too hard or you will tear the tissue. And you don’t have to use them hanging, like you often see them displayed. I made the You can just set them down and they are still adorable.. I used them here on the hearth of my Valentine’s day Mantel and small ones would be really cute on a buffet table. So do you have your halloween stuff out yet? It is almost October!! Time to get cracking!